INJURY-prone long jumper Henry Frayne has produced the performance of his life in qualifying, breaking the Commonwealth Games record. The Queenslander stunned the morning crowd at Carrara Stadium, leaping 8.34m - a 7cm improvement on his previous career best, which was set in 2012. He also takes the Commonwealth record off his teammate Fabrice Lapierre, who jumped 8.30m to win the gold medal in Delhi in 2010. Frayne, who turns 28 on Saturday, has battled injury all his career and once again had a limited preparation leading into the Gold Coast. But his talent has never been questioned and Tuesday's qualification bomb moved him to No.4 on Australia's all-time list. Frayne is a two-time Olympic finalist and a World Indoor Dhampionships silver medallist. He failed to land a jump in the 2014 Commonwealth Games final in Glasgow. IT WAS a hunch based on potential and it's now an inspired selection with teenager Joseph Deng through to the 800m final. 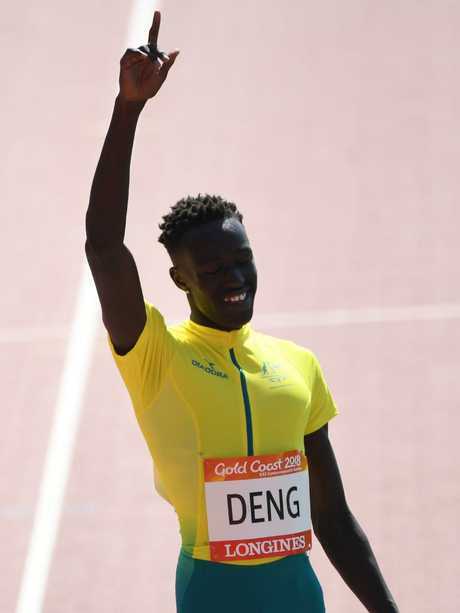 Deng was at the centre of a selection controversy when picked as Australia's discretionary third runner ahead of three-time Olympian Jeff Riseley. The 19-year-old delivered by running an inspired heat to make it through to the final as one of the two fastest qualifiers. National champion Luke Mathews looked very impressive, finishing second behind defending champion Nigel Amos to automatically go through to the final. Luke Mathews of Australia celebrates after qualifying in the Men's 800m Heats. 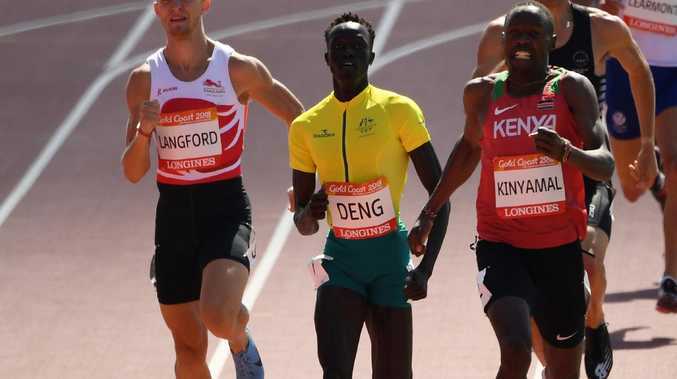 Deng ran an excellent tactical race and wasy grabbed over only the last couple of metres, finishing third in 1min45.72sec - just .01 sec outside his personal best. It was easily the fastest heat of the morning, meaning the rising star of Australia's track and field team was through to his first major championship final. "I was happy with that and it was only .01 sec off my PB," Deng said. "I hope (the final) is fast because I like fast races." Deng was born in a refugee camp in Kenya after his mother left South Sudan to get away from a war. He was aged six when his family moved to Australia, settling in Toowoomba. A move to Melbourne in January last year to be coached by Justin Rinaldi has accelerated his development. Deng was controversially selected after failing to make the final of the selection trials in February. Instead, he ran in the B-race and produced the fastest time of the weekend. 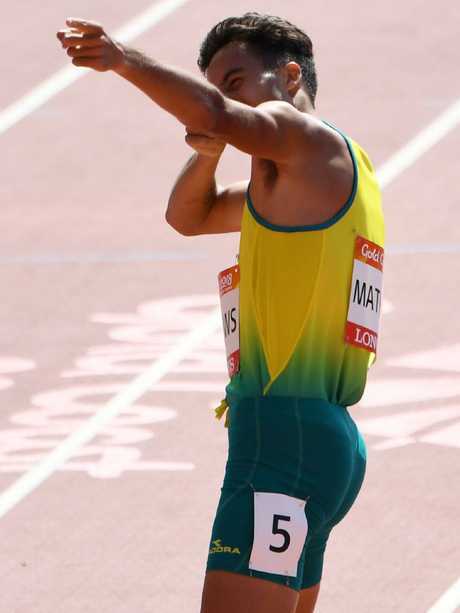 Mathews, 22, showed his class and eased down over the final 50m to run 1:46.53 sec, finishing the race with a shotgun salute to the crowd. "I knew it was going to be pretty quick," he said. "I just sat on him (Amos) and I heard the crowd on that top bend and I thought 'holy crap'. "Then down the straight I saw I was 5m clear so I just enjoyed the last 50m and finished in lane three or four, lapping it up with the crowd." The three-time national champion declared he was in the medal mix for Thursday night's final. "I think everyone in the final is beatable," Mathews said. "Nigel Amos didn't make it out of the semis in Rio (Olympics) and was fifth in London (World Championships). "This is a perfect time for us because it's April and I'm in the shape of my life right now so I'm prepared to do whatever I can. "I'm excited for the final, whereas in the past I would have been sh--ting myself." Sydney's Joshua Ralph failed to progress after finishing third in his heat in 1:47.76 sec. In the men's 400m hurdles Ian Dewhurst missed the final by one spot, running 49.84 sec. Joeseph Deng waves to the crowd after the Men's 800m Heats. Could Coast's bronzed bowlers go for gold again?